The TeslaCrypt creators called it quits recently, but unfortunately for users, there’s a new ransomware program that’s ready to take its place. Called DMA Locker, this threat first appeared in January, but its encryption implementation was so flawed that it was hard to take it seriously. Researchers had no problem developing a file recovery tool for the first two versions. However, its authors have recently fixed all issues and malware researchers believe that with the newly released version 4, DMA Locker has reached maturity and might be the next thing to hit users in widespread attacks. “The recently observed changes suggest that the product is preparing to be distributed on a massive scale,” researchers from Malwarebytes said in a blog post. Previous versions reached infected computers through weak or stolen remote desktop credentials. The new version, however, is distributed via Web-based drive-by download attacks that rely on exploit kits, meaning that a much bigger number of computers can potentially be affected. Another big change is that the encryption routine now relies on a command-and-control server to generate unique public and private RSA keys for each infection. The malware first generates a unique AES (Advanced Encryption Standard) key for every file that it encrypts. That key is then encrypted with a public RSA key and gets appended to the beginning of the file. In order to decrypt the affected files, users need the corresponding private RSA key that is in the attacker’s possession in order to recover the AES keys for each of their files and then use those keys to decrypt their content. Previous DMA Locker versions did not use a command-and-control server so the RSA private key was either stored locally on the computer and could be recovered by reverse-engineering, or the same public-private key pair was used for an entire campaign. This meant that if someone paid for the private RSA key, that same key would work on multiple computers and could be shared with other victims. All of these issues have been fixed by adopting a server-based model, which is typical for how most other ransomware programs work. Once it infects a computer, DMA Locker will now wait for a connection with the server to be established so it can send a unique computer ID and have a unique RSA public key generated for it. The good news it that, for now, the server is not hosted on the Tor anonymity network, so it should be fairly easy to block by security products, preventing the malware from ever initiating its encryption routine. DMA Locker also stands out by how it chooses the files to encrypt. Almost all file-encryption ransomware programs have a list of file extensions that they will target. Instead, DMA Locker has a list of extensions that it will not touch, encrypting everything else and potentially causing more damage. It will also encrypt files on network shares where the computer has write access, even if those shares have not been mapped locally to a drive letter. 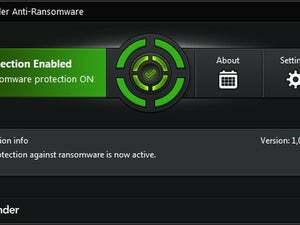 As always, with ransomware programs prevention is key. Performing regular backups to locations that are only temporarily accessible from the computer, such as an USB hard disk drive that’s only connected during backup operations, is very important.